im, chat, messenger, client, instant messaging, communication, collaboration, messaging client, im clienttion server software from mobile and desktop-based messaging clients. Instant messaging is strongly encrypted and logged on the self-hosted IM server. This app allows to exchange secure messages and communicate instantly with users connected to the same communication server software from mobile and desktop-based messaging clients. Instant messaging is strongly encrypted and archived on the IM server which is privately hosted and provided as a stand-alone application. Encryption is based on Diffie-Hellmann key exchange to generate public/private keys and all data is encoded using CAST-128 algorithm. 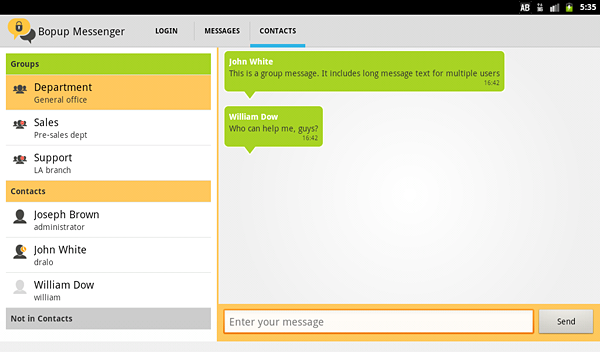 Supported features include user presence status, personal and group chat, offline messaging. Bopup Messenger is primarily designed for business and enterprise use, it allows companies and offices to have their own private and fully managed secure IM network. Instant messaging is organized on a self-hosted IM server named Bopup Communication Server that must be running on a customer's environment. It accepts users connected from Windows desktop and mobile applications, and offers history logging, management of users and messaging groups, scheduled IM for automated and urgent notification of users.